As part of an ongoing feud between Quinnipiac University and the town of Hamden, the university presented a comprehensive Five Year Master Plan to the town’s Planning & Zoning commission over the summer. Quinnipiac’s attorney Bernard Pellegrino presented the plan that was meant to serve as a reassurance to the commission’s woes of Quinnipiac students living off campus, as per the town’s request. However, instead of reassurance, the commission found the plan inadequate with its demands. The Five Year Master Plan, obtained exclusively by The Chronicle, explains how the university has attempted to “eliminate the culture of seniors living off campus” through the Senior Housing Experience: a program that touts cheaper and landlord-less alternatives, as well as exclusive senior-only events at the TD Bank Sports Center. Along with the Five Year Master Plan, pamphlets of information on the Senior Housing Experience were given out to Planning & Zoning commissioners in an attempt to exemplify the university’s efforts in getting seniors back on Quinnipiac grounds. The plan also states the possibility of increasing undergraduate bed availability by tripling up rooms that now serve as doubles, such as the Irma and Dana residence halls. Commissioner Michelle Mastropetre dove into Pellegrino’s proclamation of senior housing, pointing out the irony of promoting perks of York Hill living while suggesting tripling up rooms as a housing solution. Pellegrino responded by calling York Hill the “Taj Mahal” of dormitory living, and said he would move in himself if he could. Based on a university-conducted traffic study monitoring the driving habits of York Hill residents, Kops said letting seniors commute from York Hill is preferable to seniors renting off campus. 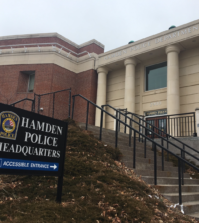 However, Kops also stated that the commission “reluctantly recommend acceptance of the policy change, with the proviso that a shuttle between the Hamden and North Haven campuses be provided during daytime classes,” a feature the university vehemently opposes. The statements by Kops, in regards to traffic and commuting policy, refer to the allowance of York Hill seniors to park on the Mount Carmel campus. Notwithstanding this fact, as of February 2012, not only senior but junior York Hill residents can park on the Mount Carmel campus at free will. The policy change came after an almost semester-long ban on junior parking, initiated last fall. Other parts of the plan show blueprints for projected areas of construction and readjustment. Some changes include moving the School of Law to North Haven and replacing the vacant building with the School of Business and the new School of Engineering, as well as the creation of future academic buildings in North Lot and College of Arts and Sciences.